Start by washing ox tail bits, and removing any hair you might find (fair warning) pat dry with a tea towel then season with a good sprinkle of sea salt and some garam masala. In a screaming hot heavy bottomed pan braise off the tail bits in a good amount of pork lard (or oil or ghee), let brown entirely and deeply before rotating bits, continue until all (most) faces of the tail are dark and seared. Now for the next step if you have a pressure cooker (not canner) or an instapot or even a crock pot that would work well, time will vary hugely depending on what method you choose, you could also use that big ol pot and keep things bubbling slowly all day long over a low simmer. I rocked the pressure cooker and it saved a ton of time. Place seared tail bits into pot and add 2 yellow onions chopped, 8 small – medium tomatoes, 4 cloves of garlic, 2″ of ginger minced, a tbps tumeric, 1 tbsp curry powder, 1 tbsp garam masala, 2 tbsp vindaloo paste, 1 tsp cayanne, 1 tsp chili, and 1 tsp salt. Cook for a couple hours then remove the tail bits. To your pot add 1 can of coconut milk and blend until tomatoes bits and onions are tiny and smooth then add 3 large potatoes cubed, and 2 cups of frozen or fresh peas. 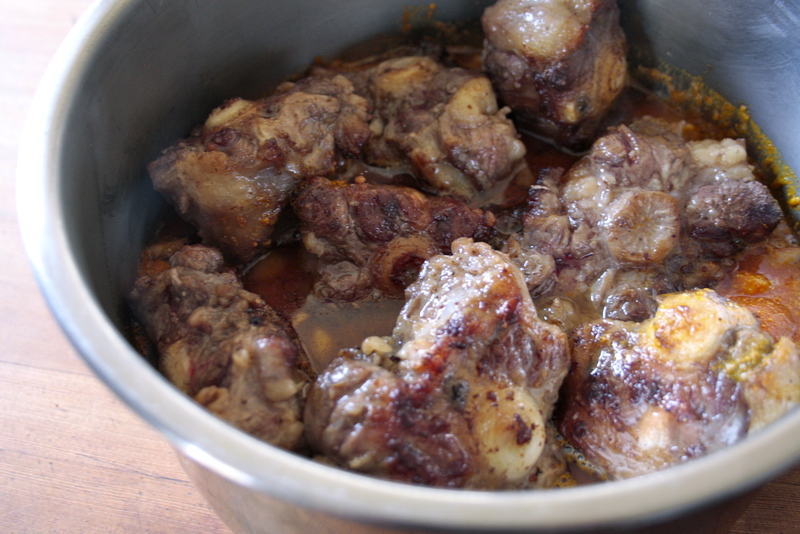 Now comes the fun part… When the ox tail is cool enough to handle start pulling the juicy meaty bits off the bone and put it back into the pot. 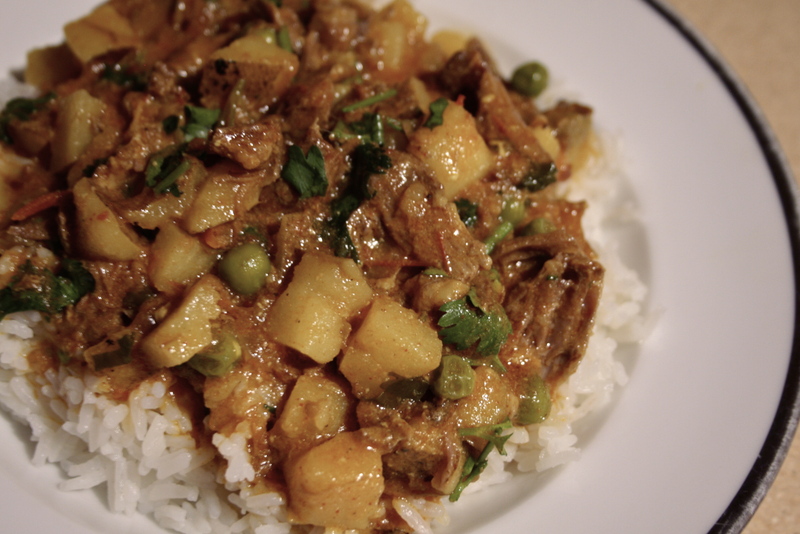 Give your dog a bone and get the curry cooking again until the potatoes are cooked through. Before serving add a good amount of freshly grated ginger, and a handful of chopped cilantro. Serve over rice and dig in. I promise you will be blown away at just how tender tail meat is.